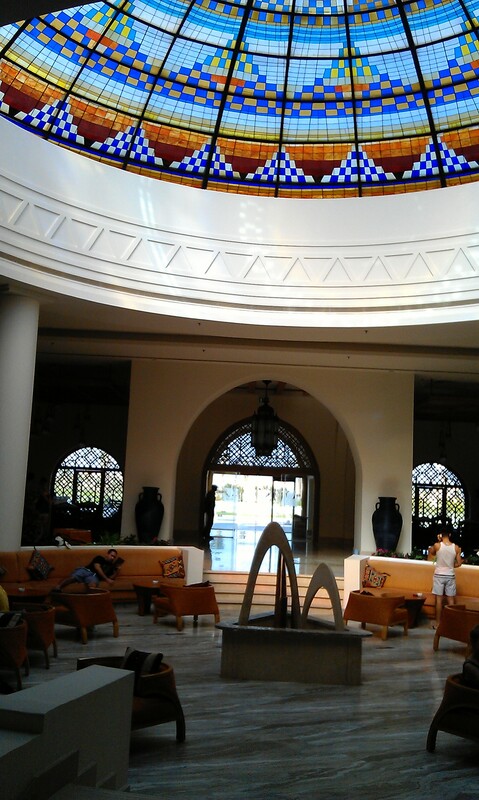 We stayed at the Hilton Marsa Alam Nubian Resort near Marsa Alam on the Abu Dabab Bay near Marsa Alam at the Red Sea in Egypt, picking it due to good reviews and the beautiful pictures. Now, many times pictures from hotels are not really accurate but here they were. It was really good. The resort sits on Abu Dabab Bay with a coral reef that we didn’t really went to see, as we were to lazy to buy a mask and snorkel and rather spend our days at the pool. 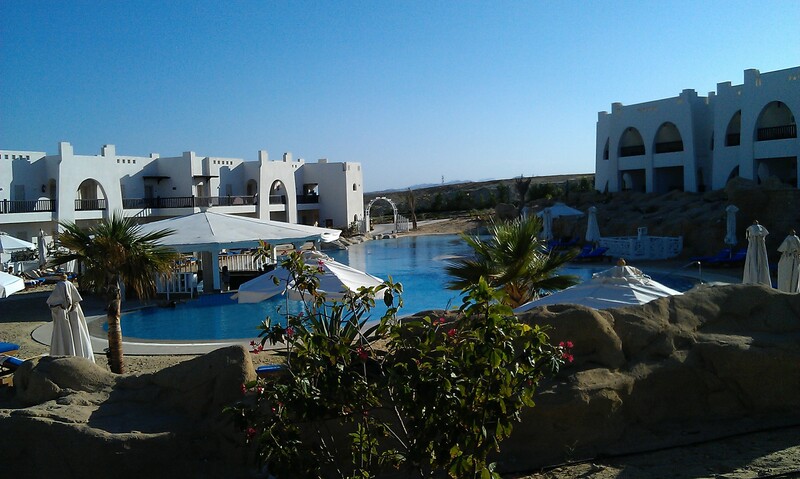 At this bay is just one other resort and other than that there is desert, lots of desert. But if you just want to relax for a week this is just fine. The resort has more than 400 rooms and suites which makes it a good size and with mostly only 2 storey high buildings spread in a beautiful garden, it doesn’t look oversized or anything. Guests now in November were quite international. Many people from Russia, Ukraine and Poland, quite a few English, French and some Swedish people and some Germans. Overall not a bad combination. As foreseen there were some families with small children. The resort is beautifully designed with gardens and has four pools. Three of them have a pool bar, two are heated in winter (which they had decided it was already with around 30°C everyday in Mid-November). One thing: there are no public toilets near the pools but with you room a maximum of about 5 minutes away this was no problem. There were always enough sunloungers and after having experienced it otherwise on our Nile cruise we thought it was really cool that they had a “no sunlounger reservation” policy. A beach towel reserving a sunlounger for more than 30 minutes with noone around was said to be removed and you had to pay to get it back. The beach is a 5 minute walk or a 2 minute ride on an electrical train, running every 10 minutes or so, away and is big and has lots of sunloungers and sunshades but we spend more time at the pools. The resort has a huge main building including the main restaurant with several food stands and the lobby with a huge sitting area underneath a huge glass dome with lots of colourful mosaics. 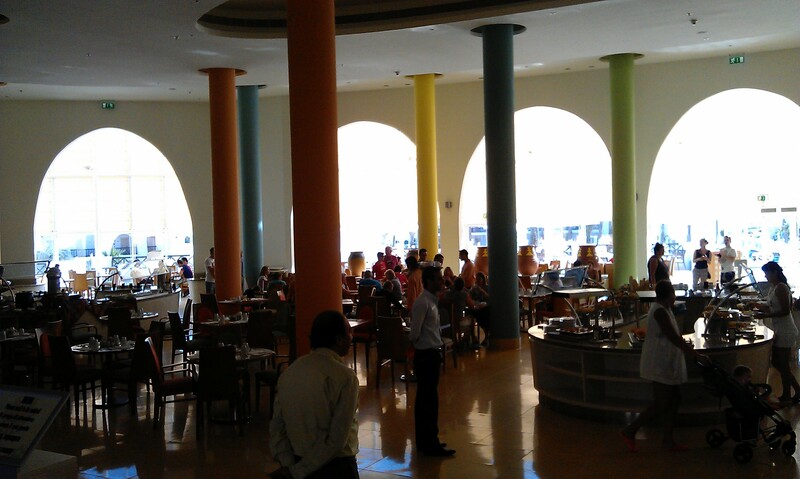 In the lobby area are also two bars so waiters come around to serve you when you are sitting there. On the one side of the building there is also a small shopping area and the Souk Cafe, an oriental restaurant and bar where you can smoke water pipes and the Axis bar where the nightly entertainment took place. The huge main restaurant wasn’t the nicest place, just a little too big, too bright, too high and therefor too noisy but well, you can’t have it all, can you. The food was ok. Nothing that you couldn’t eat (maybe except for some really tasty looking but unchewable lamb) or would get sick from but with the ingredients they used they could have done better. Regional food was always well seasoned but when it got too more western style cooking especially cream sauces (no idea who needs them anyway in a warm climate like there but that’s just a personal thought here) seasoning would have helped a great deal. Looking at drinks, the all inclusive package included soft drinks and all local alcohol which is completely fine. They do charge for coffees like espressos and the like, imported alcohol and fresh juices. You could also get cocktails, some all inclusive, some for an extra charge but the all inclusive menue was just fine for us. 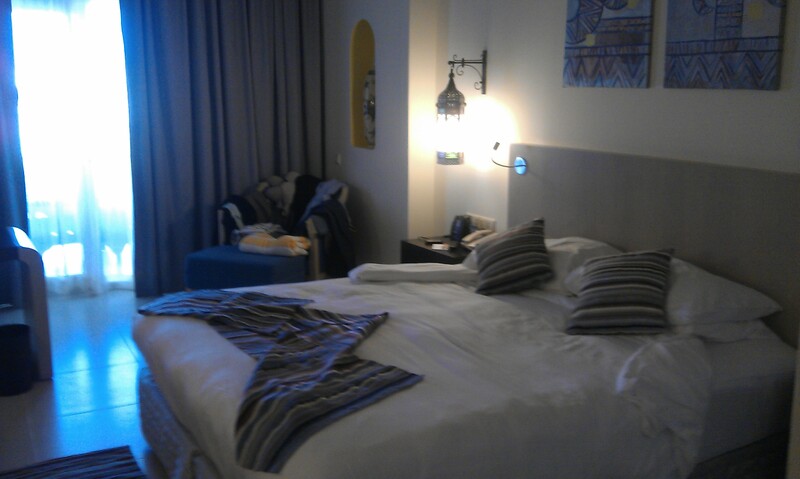 Honestly this was the nicest hotel room I ever stayed in, at least in a resort hotel (my picture unfortunately doesn’t show it that well). Beautifully decorated and always super clean (I dropped a little box with earplugs once and it rolled under the bed and I didn’t really bother to go looking for it in the morning. After the room had been cleaned, the box was up on my bed side table again, showing that our cleaning man did his job more than properly). 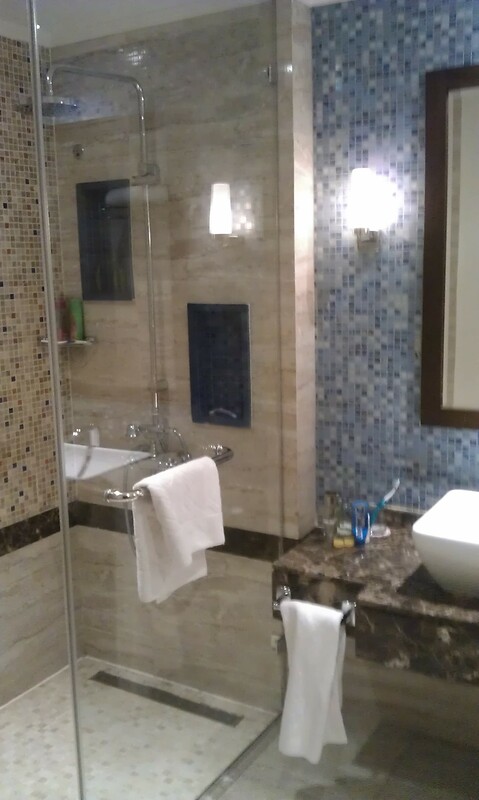 The bathroom was marvelous and a huge flat screen tv a delight. And even though for my back the beds were a bit too soft, Michael slept very well there. As said, the cleaning is absolutely perfect and everyone from house and ground keeping you would meet in the resort was always super friendly. The people at the bars and in the restaurant were friendly too but on the main pool during midday they could have done with one more barkeeper to get things done a little more quickly and waiters in the restaurant could be a little more attentive or maybe just a little more organised. In the morning it could take ages to find someone with a coffee or tea pot because most waiters were busy taking dirty dishes away or setting tables. Front desk employees were quick and helpful and after checking with us if we really wanted a twin bed room (which we didn’t) we got upgraded for free to a king size bed bedroom with pool view. Internet was a bit difficult to get by if you don’t bring your laptop because cable internet in the room is for free. They have wireless internet in the lobby which was not always too stable and two computers in a niche behind the shopping area but hey, you are on holidays, not working, hopefully. And all this was not very expensive. 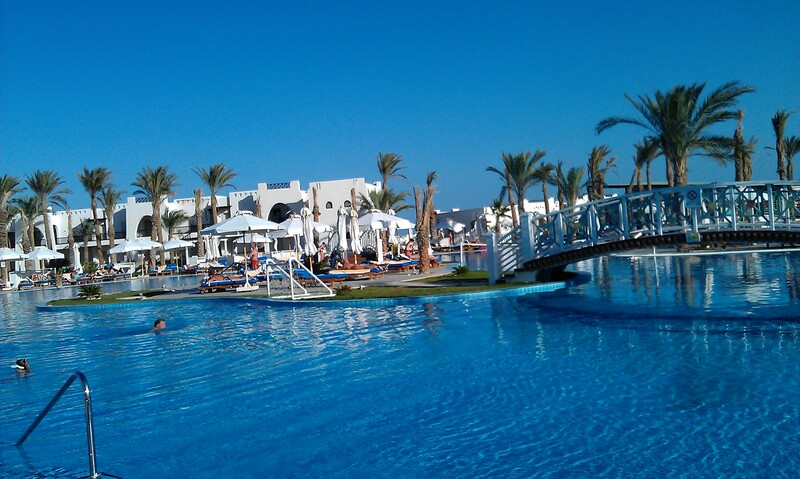 So after all a great value for money holiday resort. And if you are travelling with little children this place caters for them too and all the little ones, running around there seemed pretty happy. 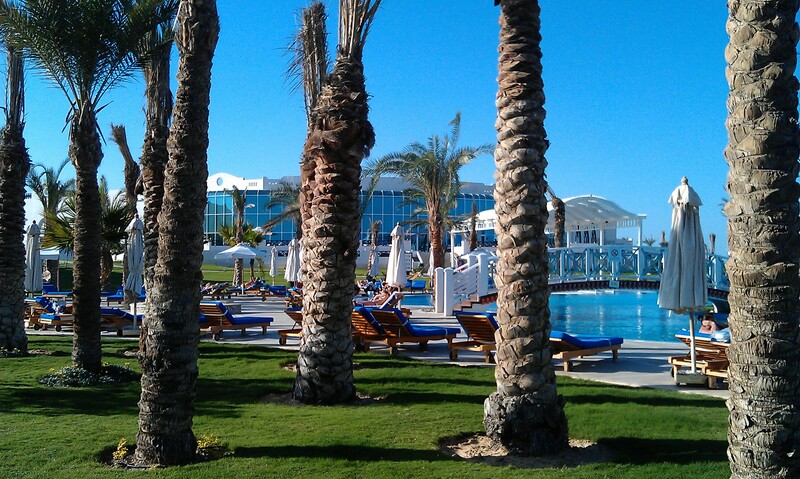 This entry was posted in Egypt and tagged Hotel, Marsa Alam, Resort, Review by kathatravelling. Bookmark the permalink. Thank you for this review! Going there in 14 days from today 26/3. It looks fantastic! Best regards Helen from Sweden.